Bay Area Mohel, Rabbi Gil Leeds, C.M. received his Rabbinical ordination from the former Chief Rabbi of Israel, Rabbi Mordechai Eliyahu ZT'L, and is Certified in the traditional method of Brit Milah. Trained by expert Mohalim from Israel, New York and California, Rabbi Leeds comes highly recommended by Urologists, Pediatricians, and other MD's, and has a long list (1,000+) of satisfied clientele in Northern California and throughout the states of California and Nevada. 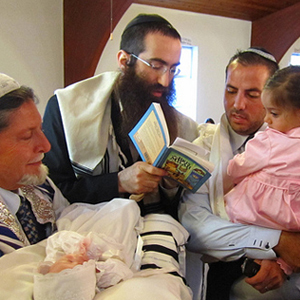 Rabbi Leeds is an alumnus of UC Berkeley and lectures regularly on the topic of Jewish Circumcision at Jewish Medical Ethics seminars at the University of California, Berkeley and at numerous Jewish communities throughout the Bay Area. 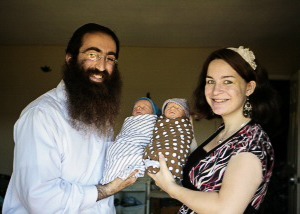 Rabbi Leeds has much experience and extensive advanced hospital training in the performance of adult circumcision, and has been trained and utilizes modern pain-management techniques in his adult circumcision practice. Rabbi Leeds is primarily devoted to performing infant Brit Milah's, recognized as an "expert surgeon of the Brit Milah procedure" having performed 1,000+ infant procedures. The time-honored traditional "Mahgain" (ie. Hebrew for "Shield") technique which Rabbi Leeds employs for Jewish circumcision yields the most ascetically pleasing results and is painlessly completed in the blink of an eye. Done in the calm and comfort of your own home, or in a synagogue / community center, the Brit Milah is truly a holistic experience which links one generation to the next. The baby is lovingly held by a parent, grandparent or family friend throughout the process, and is back in his mothers arms within moments. Before the Brit Milah, a numbing cream is applied and several drops of Kosher sweet red wine are administered to the baby, providing a safe pain control method where the baby is calm and peaceful from beginning to end. Rabbi Leeds regularly attends circumcision seminars as well as contributing to many Mohel forums as the expert in his field. Known for his kind and caring personality, Rabbi Leeds is committed to providing a sense of confidence and calm to anxious first-time parents. Follow-up calls and proactive check-ins after the procedure are the norm. With a meticulous attention to fine detail and deft skill; parents, pediatricians, nurses and midwifes often mention how quick the procedure is and how excellent the outcome is. Rabbi Leeds enjoys working with Jewish families of varied observance levels and is committed to making the Brit Milah experience a most inspirational and memorable one. Jews and non-Jews alike comment on how the ceremony which Rabbi Leeds conducts is the most educational, inclusive and meaningful service they have ever attended. Rabbi Leeds is a full-time Mohel and considers it a great privilege to be able to provide the Bay Area, Nor CAL, and Silicon Valley Jewish communities with the important "mitzvah" of Brit Milah and he is committed to making sure that no Jewish child will ever miss out on a Brit Milah for financial reasons.